Flank steak is one of those items I keep in stock in the deep freezer since its so fast to cook, inexpensive and versatile. 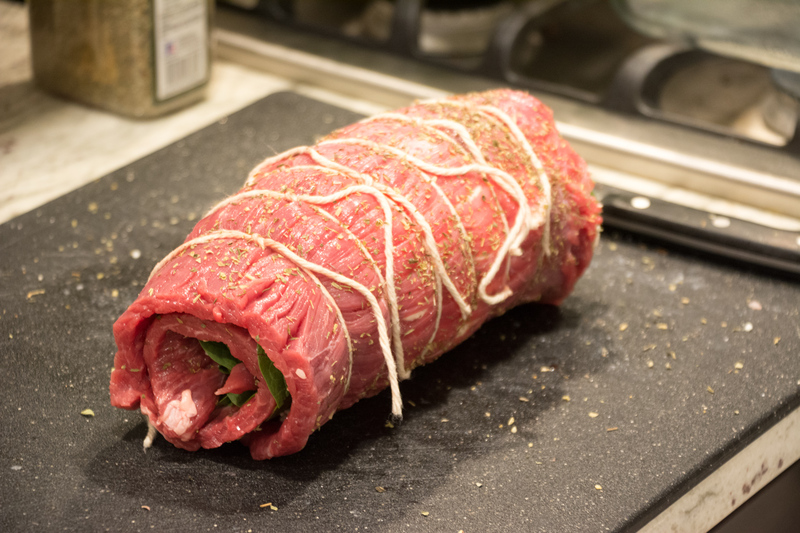 I’ve made a stuffed flank steak before but it was pretty complicated and had to cook for a long time. 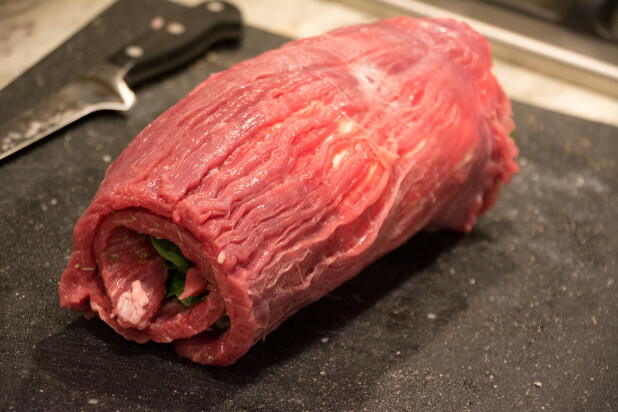 By slicing the flank steak into pinwheels, it reduces the cooking time and simplifies getting the right temperature, plus it looks cool 🙂 Instead of stuffing the flank steak, we’re going to layer it with whatever we feel like. 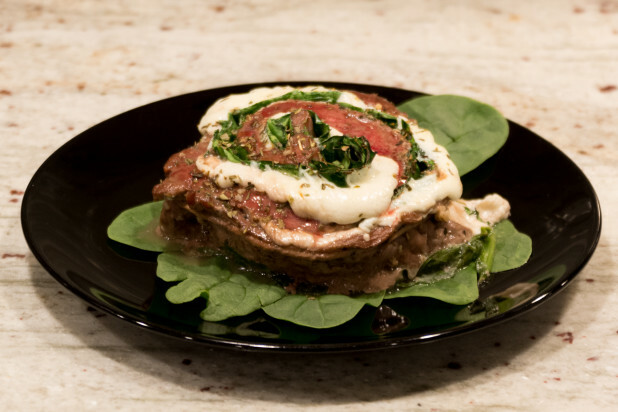 I chose to use mozzarella and spinach! 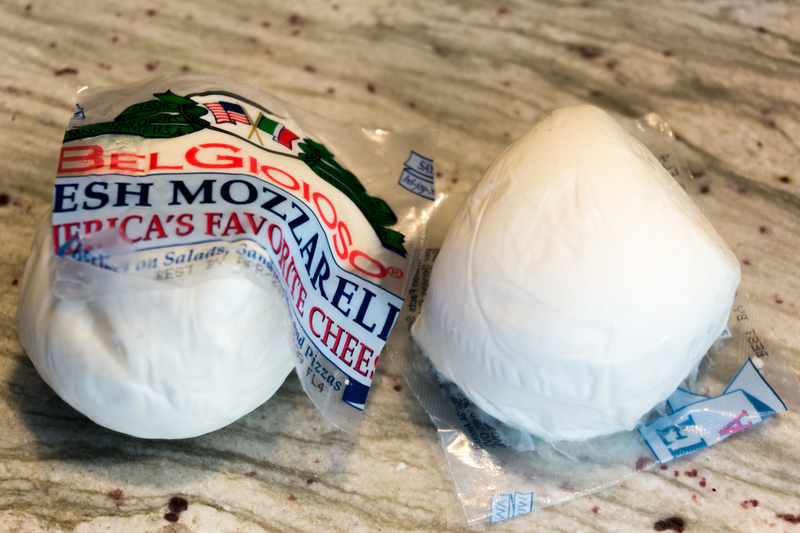 These balls of mozzarella are 8 oz each and come in three packs at BJ’s. I just buy a bunch of them when they’re on sale and freeze them. That way I’m ready whenever I need some. As you know by now, we shred all our own cheese using a food processor at the CMK house because its cheaper, you know what quality cheese goes into it, and it reduces the carbs by not including binding agents. 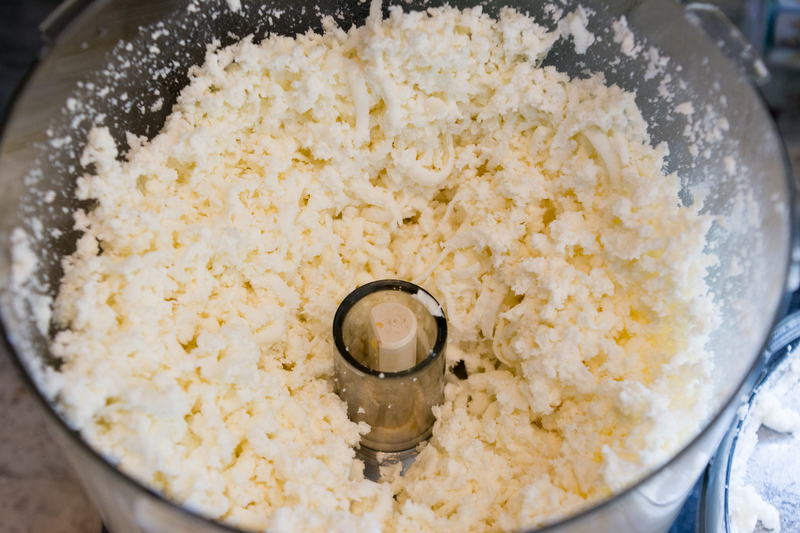 Mozzarella is a little hard to shred since its so soft so I normally shred it when its a little frozen. 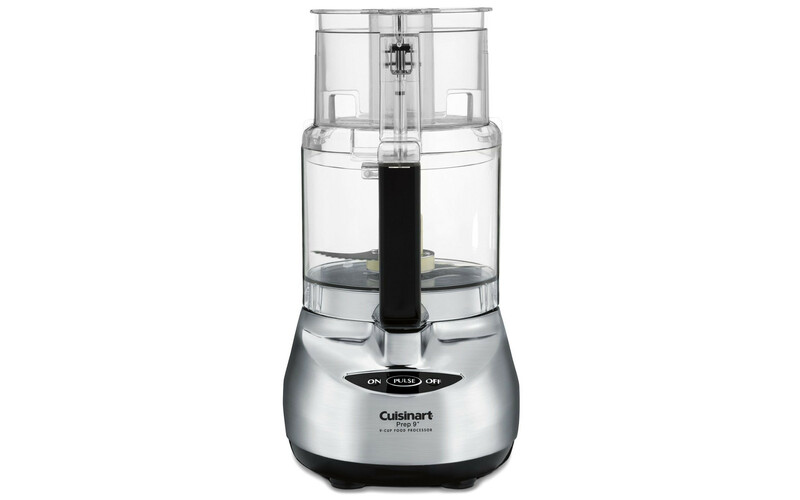 For this recipe we basically want a paste anyway so it doesn’t matter if the food processor turns it to mush. 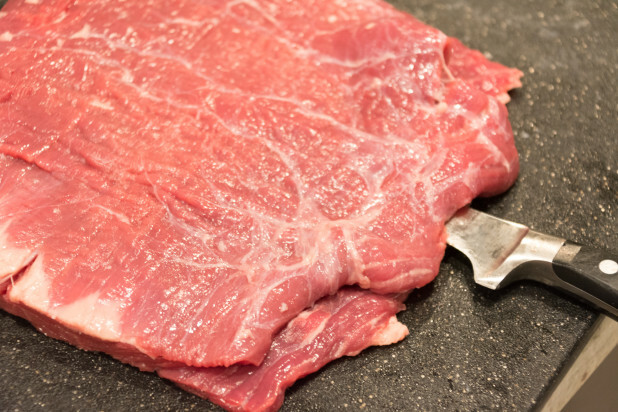 Here’s the flank steak they’ve got at BJ’s. This is what it looks like when you first unwrap it. For this first part, set it on the cutting board so the grain is aligned from right to left as shown (as opposed to up and down). For this recipe, we want sharp edges for when we’re rolling our pinwheels so you want to slice off the edges to square it. Don’t go nuts, just enough to have better edges. 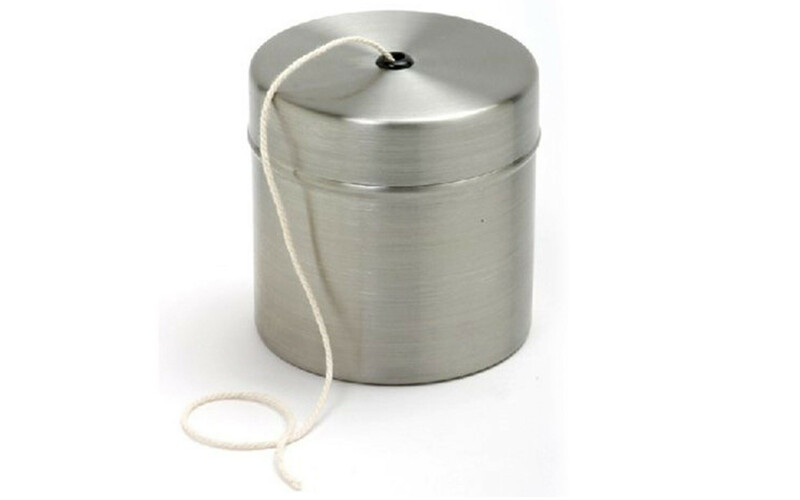 Also remove any hard deposits of fat and any loose, clear membrane you can get off. 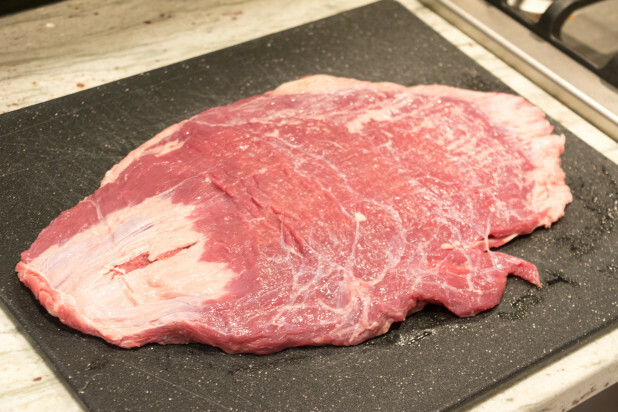 Then, slice through the flank steak with a really sharp knife. Leave the back edge intact as we’re going to fold it over when we’re done. This part is a little hard, go slow and try to keep the knife parallel to the cutting board and in the middle of the meat. 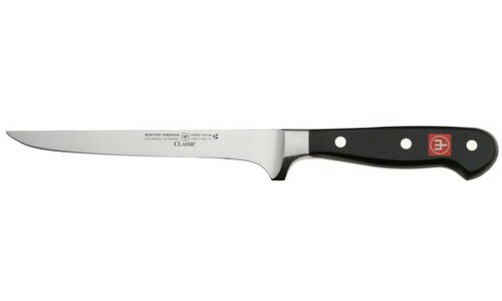 Make sure you are cutting with the grain as pictured. 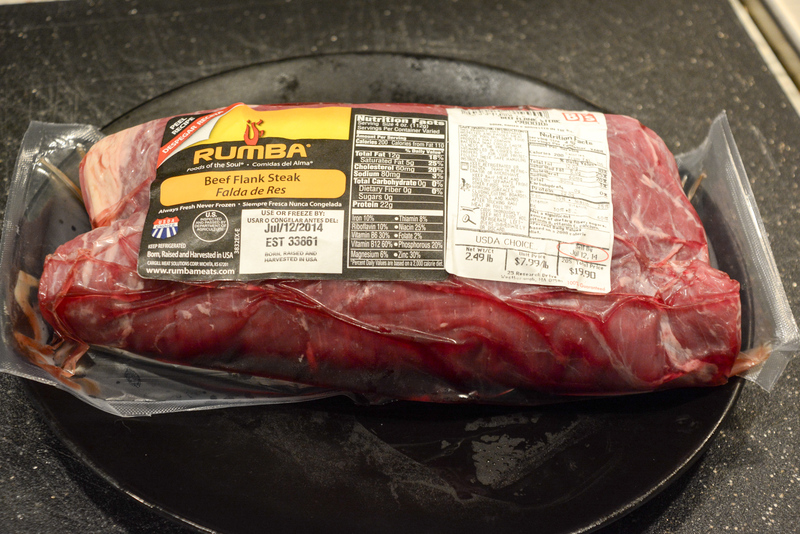 Now, once you’ve cut through, fold the meat open and cut the seam until its only a 1 inch overlap. Then flatten the flank steak. 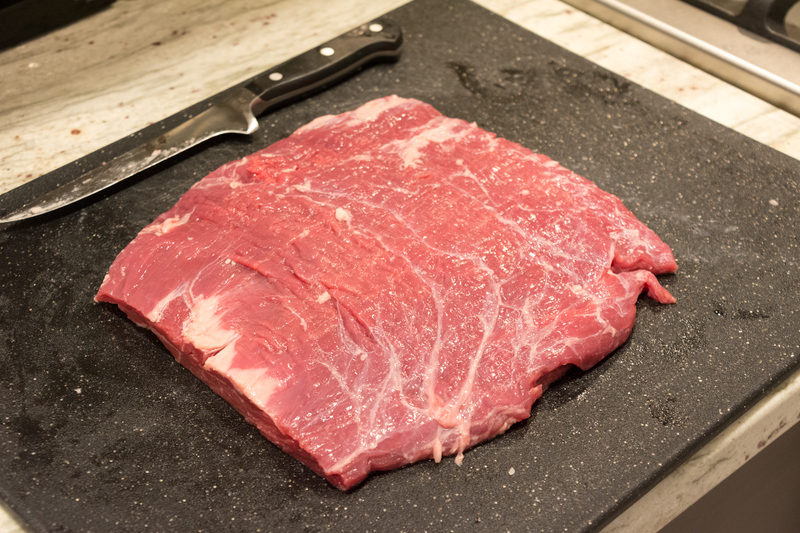 Note that I rotated the flank steak in the above picture so the grain now faces vertically, up and down. Season both sides with Italian Seasoning. 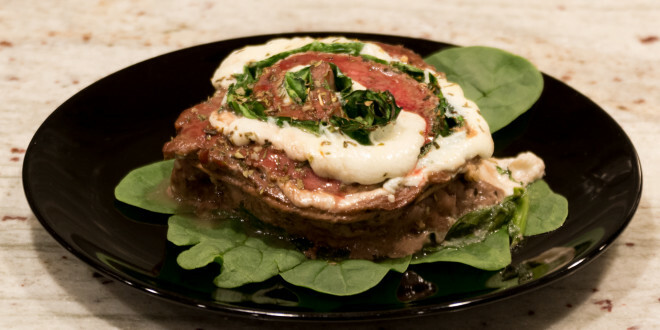 Spread the mozzarella cheese, and then the spinach over the meat. You want to leave an inch or so on the top so when you roll it, the fillings don’t spill out. Note in the picture above I was confused at first and I put the 1 inch on the wrong side. It should be on the narrow part, so in the bottom left part of the picture. I messed up and put it on the top of the steak. Then carefully roll the flank steak up, making sure to keep it tight. You are rolling it the narrow way, so that you are rolling against the grain as shown. 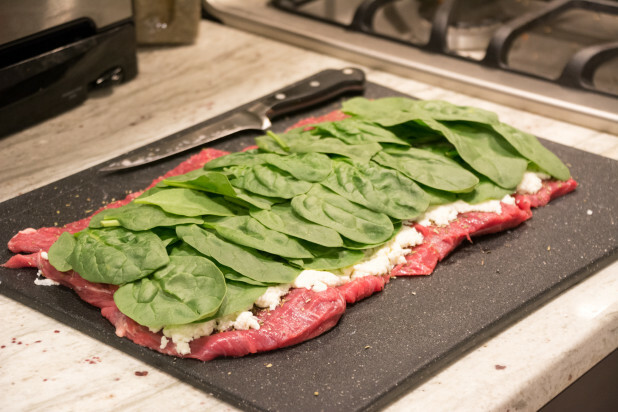 Now cut 6 pieces of cooking twine and tie the flank steak off in 6 equal sections. 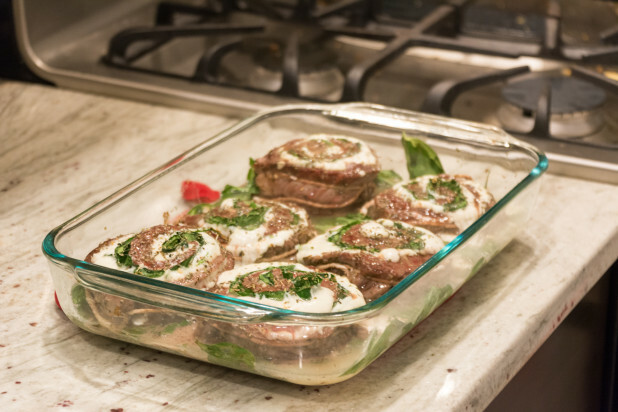 Season the outside with more Italian Seasoning. Lay some more lettuce in a pyrex baking dish. Slice the pinwheel in between the strings so that each pinwheel still has a string on it. Make sure to use a really sharp knife and be careful to keep the pinwheels together when transferring. 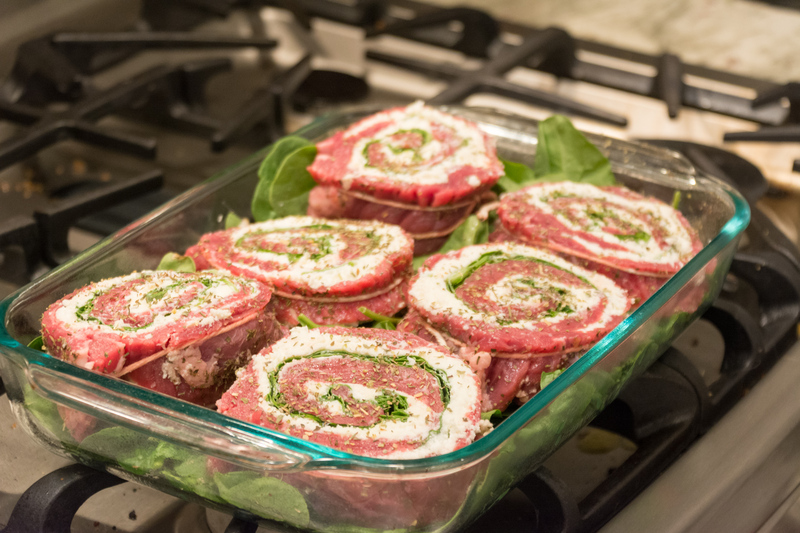 Here’s the finished Flank Steak Pinwheels! They turned out really well! I’m also excited to try other fillings next time to see what flavor profiles I can develop! 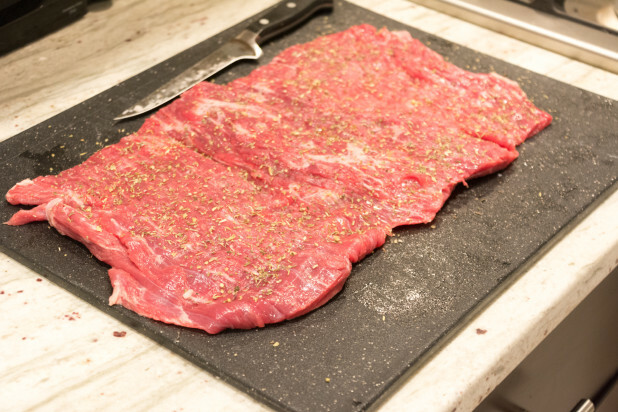 We love flank steak on the grill – with bacon, of course! You partially cook the bacon, then lay your flank steak out, season it as desired (I like to use garlic powder and McCormick’s Seasonal), then lay the bacon out in strips, all over the flank steak, roll the flank steak up, like you did for the stuffed flank steak recipe, secure with toothpicks, then thinly slice it into your rounds and place on your grill. 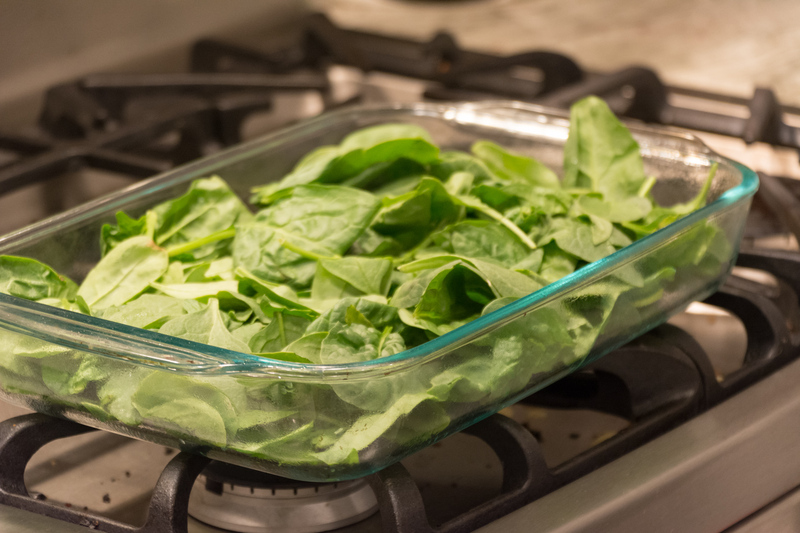 Slicing it thinly helps it to cook quickly, evenly, and you get to eat more than just one! My husband calls it “Poor man’s filet mignon”.